Back in Washington, The Washington Post selected Cento for its advertising campaign. 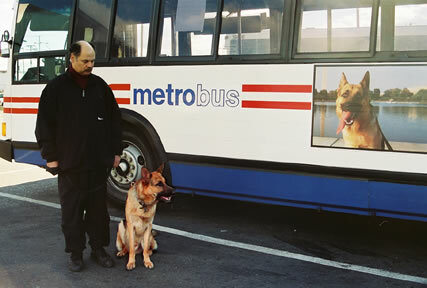 Suddenly, large posters featuring Cento were plastered all over the Washington Metropolitan Area and on all Metro Buses. 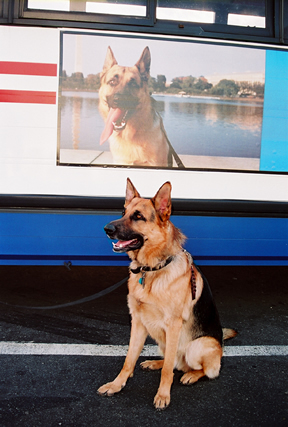 Cento posing in front of his poster on Metro Buses in Washington, D.C.
Cento admiring his posters on Metro Buses in Washington, D.C.
Jutta� took up in earnest the training of Cento in Schutzhund. But the lines of our lives cross in mysterious ways. Cento was nearing two and a half years old� when disaster struck. Cento passed on. Our sadness was immense. I decided that the only way to recover was to have another German Shepherd Dog, who would distract our attention and bring back the joy that Cento had brought to our house. To me, the choice of a puppy was clear. He had to be a direct descendant of Eiko vom Kirschental, like Cento had been. And, not by coincidence, Ulk was the grandson of Eiko. At least, by getting a son of Ulk, we would have as close a relative of Cento as possible. That was somewhat comforting � the new puppy could thus provide a symbolic link to Cento.